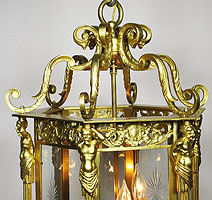 An English 19th/20th Century Neoclassical Style Figural Hexagonal Gilt-Bronze Lantern with figures of bearded male caryatids and winged gargoyles, possibly supplied by Lenygon & Co. Circa: London, 1900. The firm of Lenygon & Company was located at 31 Old Burlington Street, London. It was founded in the early 1900's and had an important clientele including the Earl of Pembroke, the Duke of Devonshire and W.H. Lever. 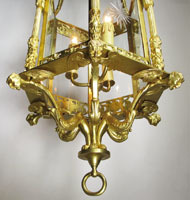 The firm also worked as decorators and suppliers of fine antiques and reproductions for Lord Leverhulme. 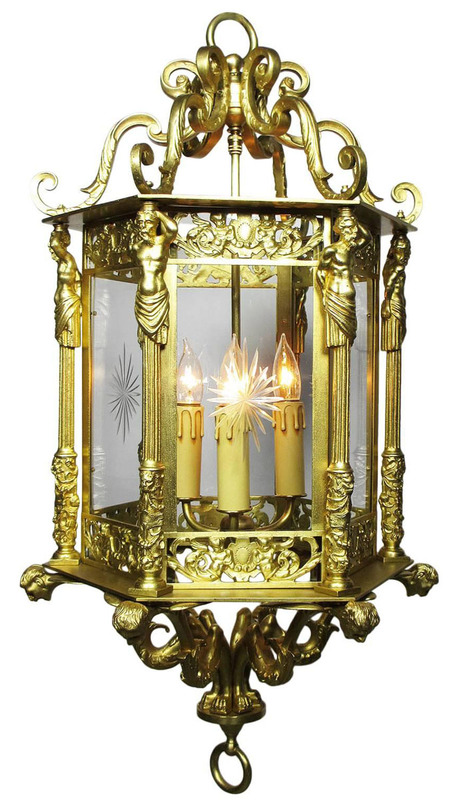 An English 19th/20th Century Neoclassical Style Figural Hexagonal Gilt-Bronze Lantern with figures of bearded male caryatids and winged gargoyles, possibly supplied by Lenygon & Co. Circa: London, 1900. The firm of Lenygon & Company was located at 31 Old Burlington Street, London. It was founded in the early 1900's and had an important clientele including the Earl of Pembroke, the Duke of Devonshire and W.H. Lever. 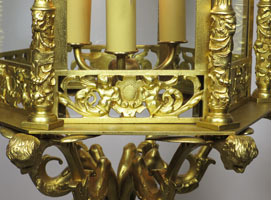 The firm also worked as decorators and suppliers of fine antiques and reproductions for Lord Leverhulme.